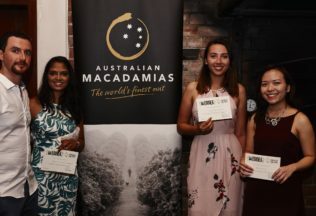 The winners of Australian Macadamia’s world-first Innovation Challenge have been revealed, along with a number of new innovative macadamia food products. Hosted 1 March 2018 in Byron Bay, NSW, the Australian Macadamia Society invited innovative food industry professionals and students to develop new value-added food products using macadamias. Australian Macadamia’s Market Development Manager, Lynne Ziehlke, said the idea behind the Innovation Challenge is to drive new demand for macadamias amid increasing global supply. “We know that global production is increasing and that consumers want to see more products with macadamias,” Ziehlke said. The challenge involved finalists from across Australia visiting Byron Bay to create their innovative macadamia products before presenting them to a panel of expert food judges. Judges for the challenge included Pam Brook, Co-Founder of Brookfarm, Nick Palumbo, Founder of Gelato Messina, Barry McGookin, General Manager at Food Innovation Australia and William Peterson, owner of Infinity Bakery. Winners of the challenge’s three categories included Adeline Wong, winner of the professional category with a superfood “Macadamia Mind Food Bar”, Kinga Wojciechowski, winner of the student category for her Macadamia and Miso Caramel Cookies and Ashna Gobin and Leonardo Bohorquez, winner of the student pairs category for their ‘macci’ ice cream. Winners of the professional and student categories have won trips to SIAL food exhibition in Paris in October 2018. The student pair winners were awarded a $5000 cash grant to go towards their studies. Judge, Pam Brook from Brookfarm, said all the judges were impressed by all of the entries. “As soon as these products touched our tastebuds we loved them,” Brook said.